Size of the Industry Indian screen printing industry can be said to have about 65,000 - 1, 00,000 printers. Output per annum The annual turnover of all the components in the Indian printing industry are more than Rs.50,000 crores that is USD 11 Billion. 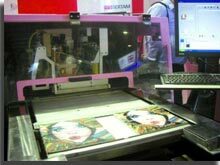 Indian Printing Industry has undergone many revolutionary changes in the past 15 years. India in the year 1990 initiated a process of reforms which aimed at shedding protectionism and embracing liberalization of the economy. Privatization was emerged with the aim of integrating the Indian economy with the world economy. This drastic change in the country's economy opened the doors for the Indian Print Industry to modernize, by investing in the latest of technology and machinery. For the last 15 years the average compound annual growth rate has been higher than 12%. Post 1990 the trend was to acquire the latest and the best equipment & machines. Today the progressive printers are equipped with the latest computer controlled printing machines and flow lines for binding, while the state of the art digital technologies are being used in pre-press. Leading Printing companies have optimized the use of information technology in each and every area of the Printing business. Printers today are equipped at par with the best print production facilities in the world. India is becoming one of the major print producer & manufacturer of printed paper products for the world markets. The Printing Industry's quality standards have improved dramatically with immense production capacities. Some Printers in the country have won recognition by winning prizes at international competition for excellence in printing. Over the years the Indian Printing Industry has gradually grown in all parts of the country. This industry has not been affected by the advent of TV and Internet causing no hindrance to the growth of and requirement for printing professionals. In recent times the industry has made giant strides by improving its machinery in terms of the technology and speed. Today Computers and electronics have invaded all the departments of printing which are improving quality and speed of the jobs executed with the consequent enhancement of costs enormously. In fact emergence of computers has complemented the printing business and has played a significant role in increasing its status as a clean profession. The So-Called Hubs for Printing Industry are a set of industry players who are growing systematically and regularly. They are usually the proprietors who carry their own business & who specifically do not belong to any specific region of India but are scattered all over the country. For ease there are clusters of printing Industry which are present in North: Amritsar, Delhi, Faridabad - West: Ahmedabad, Bombay, Gujarat - South: Bangalore, Coimbatore, Madras, Hyderabad. The Printing business in the private sector is also quite large in number and these are scattered throughout the country. But generally majority of them are very small in operation and are carried out on proprietor basis. These are even confined to producing titles in Indian regional languages and catering the needs of the local markets in the cities. Very few (about 10%) of the Printing concerns in India are reasonably large producing more than 50 titles annually and are equipped with proper infrastructures and basic amenities such as printing presses and distribution networks. In totality, today Indian Printing Industry is one of the greatest in the world and the country is counted among the top seven publishing nations. There has been an increased number of printers which are adopting newer modern technologies. The growth in these organizations indicate that recession is nothing but a changing trend towards adoption of new style of working. Today in this era the modern style of business is completely favoring consumers. The business owners ensure that they give optimum quality products at bare minimum price to the customers. Probably in all areas of life the consumers are getting products at most competitive prices, which is definitely lower than yesterday's prices and printing industry is no exception. To meet this challenge, people in the printing industry have to find the solutions and not fret on decline in prices. Some printers with a vision have already taken a step towards it and are able to produce printed products at much lower unit price by adopting new technologies. Indian screen printing industry can be defined as the multicolored and multi-layered as the country itself. It exists since 40-45 years and it has touched almost all segments like textile, ceramic, industrial, CDs, POPs, advertising and digital. India the country which is centuries old, vast, enormous and has second largest population in the world, the printing Industry is reasonably young and not that large probably doing the background work for all the main industries. Even though one would argue about numbers, the Indian screen printing industry can be said to have about 65,000 - 1, 00,000 printers. Despite the size of the Indian Printing industry, it is one of the most dynamic sectors of the Indian Economy with an annual growth rate of about 15 - 20%. Due to the huge potential of the Printing industry for growth, all international brands and players are represented in India either directly or through their distributors. The annual turnover of Indian printing industry is more than Rs.50,000 crores that is USD 11 Billion. Printing jobs are being exported to over 120 countries of the world both developed and developing nations. During 2004-05 the Indian exports of books, printed pamphlets, newspapers & periodicals, job printing and printed materials was estimated to the tune of USD 550 million. The Printing activity is done with the help of printing technology. Printing process has evolved as a hi-tech proposition. There is an increased and efficient use of computers, lasers and microprocessors which have turned Printing Industry into a multi-disciplinary profession. There are many reputed colleges, universities and institutions offering degree & diploma programs in printing technology. The duration of the full time courses are three years. For a regular diploma, one should have passed 10th standard. There are also short-term certificate courses which offer a comprehensive study of all the aspects of printing. In coming years qualified printing professionals will be in demand. Jobs for printing technologist are usually available in newspapers/magazines, advertising agencies, machine manufacturers, Railway Presses, packaging industries, book printers as well as private commercial press. Today the Indian Sub- continent has over 1,30,000 of all types of printing presses all over the country and more than 10 Million family involved in the Print Industry crossing 20 Billion + Turnover and the Per capita consumption of Paper & boards - 4.5 KGs per year. Today the machinery new and second hand, used is predominately from China, England, and France, Germany, Italy, Japan, the Netherland, Switzerland, Spain, Taiwan, USA. Employment created by Indian Printing Industry is Total No. of Printing Presses Turnover Directly 7,00,000 1,30,000 20 Billion + Indirectly 4,50,000 60,000( offset, sheetfed - webfed). The Indian print industry in recent years has recorded a 12.6% CAGR which is expected to grow till Rs.232 bn from Rs.128 bn by 2011. Indian print industry is highly fragmented according to the languages like the Hindi, Telugu and other major languages of the country There are number of Indian print players who are confined to their local regions and would like to refrain from entering new territories due to lack of funds. The relaxation in foreign investment regulations by the government in 2002 has given the industry a leverage to expand further.